Hi all! Yes, back to back posts! That's what ya gotta do when there's a contest deadline! 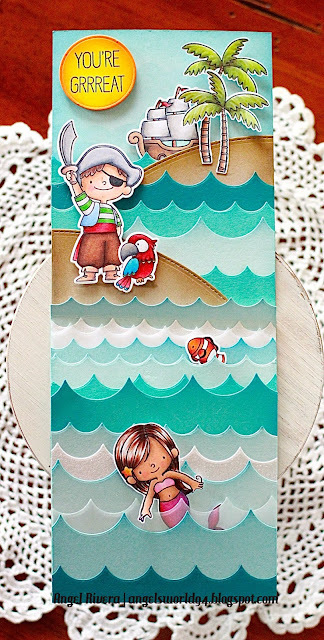 Here's my card for the Coloring Virtuoso Category in the MFT contest! 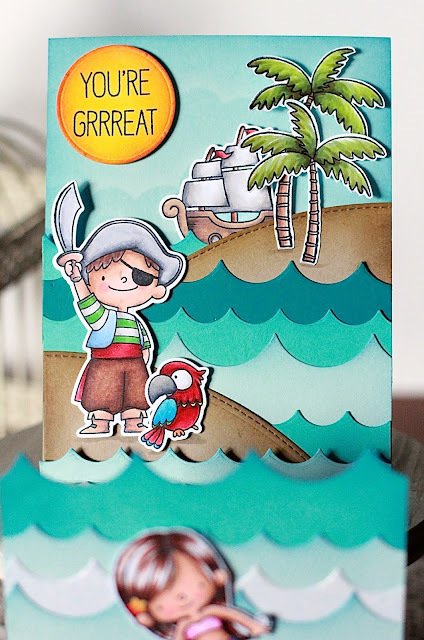 I'm worried I should've put it in the Clean & Simple Genius category but it is what it is ;) I love the color combo! 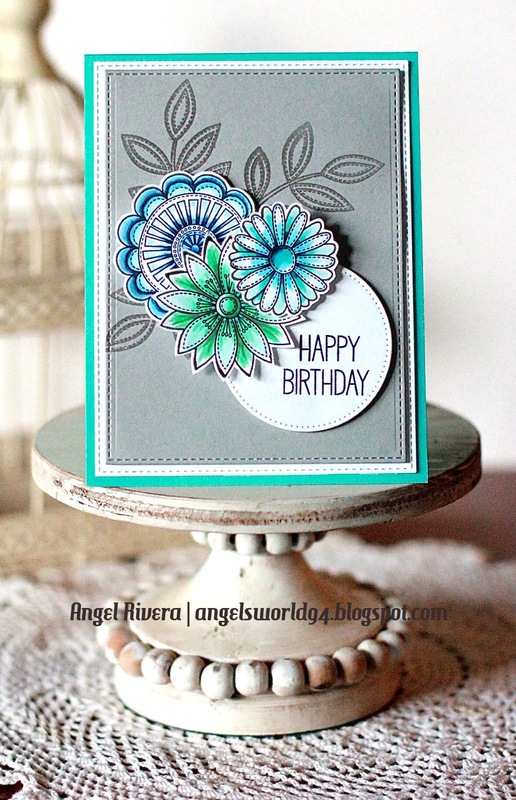 The leaves from Funky Flowers are embossed on the Cement Gray card stock. The flowers were colored with Copics. The sentiment is from the Up in the Air set. Hi all! Here's my Innovation Master Challenge Card for the MFT contest! This is a Z-Fold card. The first pick is of it completely open and flat. Lots of sponging and coloring with Copics. All MFT card stock and images, of course!!! This pic show it closed. (well, somewhat) ;) This would be what you would see when you take it out of an envelope. Here, part of it is laying on my little card stand. HI all! 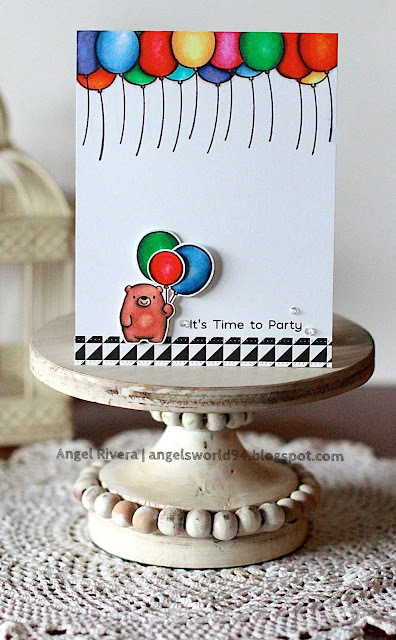 So one of my absolute favorite crafting companies, My Favorite Things, is having a MEGA contest! I created this card for the Clean And Simple category. This bear knows how to decorate for a party :D Lots of masking of balloons but I just love it! The balloons are from the retired Panda set. 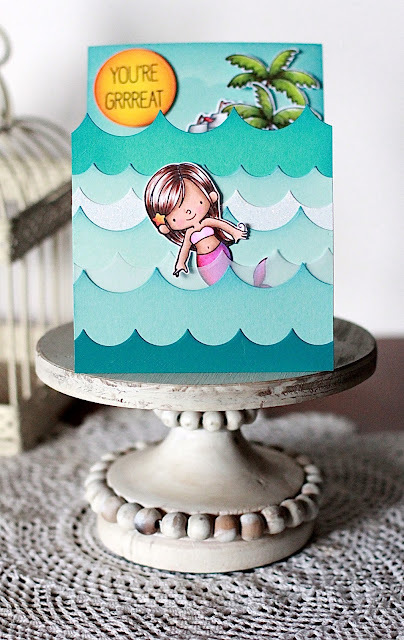 I couldn't pass up the BB Bitty Bears stamp set from the latest release. I added two extra balloons for him to hold ;) The sentiment is also from that set. The cool 'floor' he's standing on was cut out with one of the Blueprints elements and is from the Black & White Basics paper pack. Everything was colored with Copic Markers. A trio of sequins finish it off. Hi all! i'm here with a card I made for the MFTWSC349. I masked a few of the owls from the For Owl You Do stamp set, then fussy cut them. The embossed sentiment is also from that set. I cut it out with the pierced Fishtail Flag STAX. I stamped the cement gray card stock with a retired MFT BG stamp with grout gray ink. Hi all! 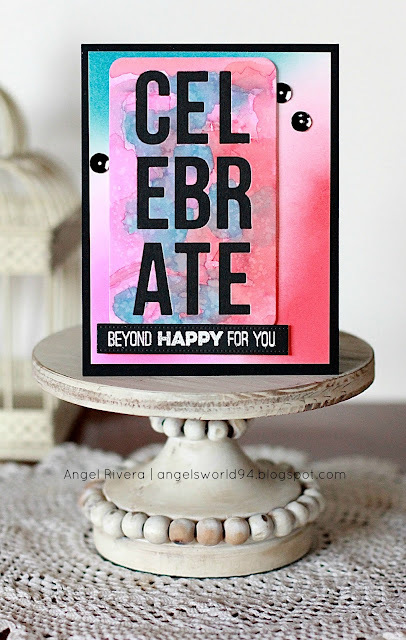 It's time for a new CAS-ual Fridays Inspiration Challenge! This time the challenge was to CASE one of the girls on the Inspiration Squad. I chose Channin's card that you can see HERE. 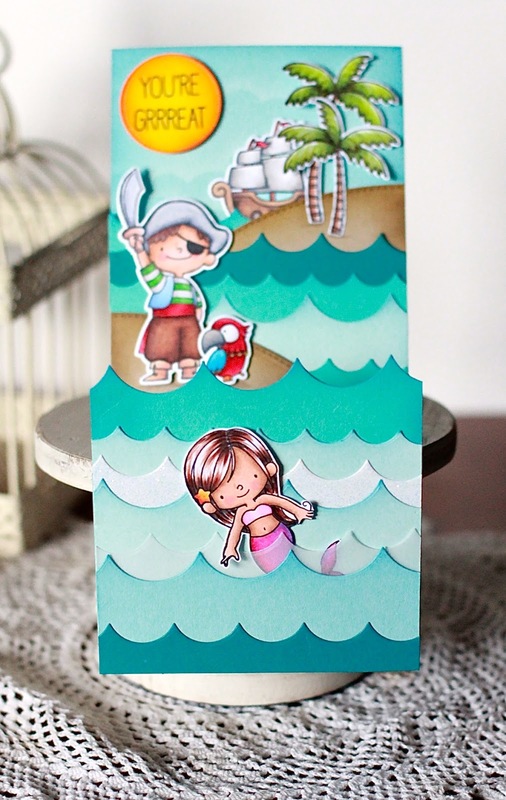 I used the Mon Ami stamp set and dies. Remember to play along with us for your chance to WIN a $25 gift certificate to the CAS-ual Fridays store!!! Hi all! It's time to get the challenges started up over on The Card Concept Blog! This week, we have a beautiful picture to inspire you - check it out on the TCC Blog HERE! 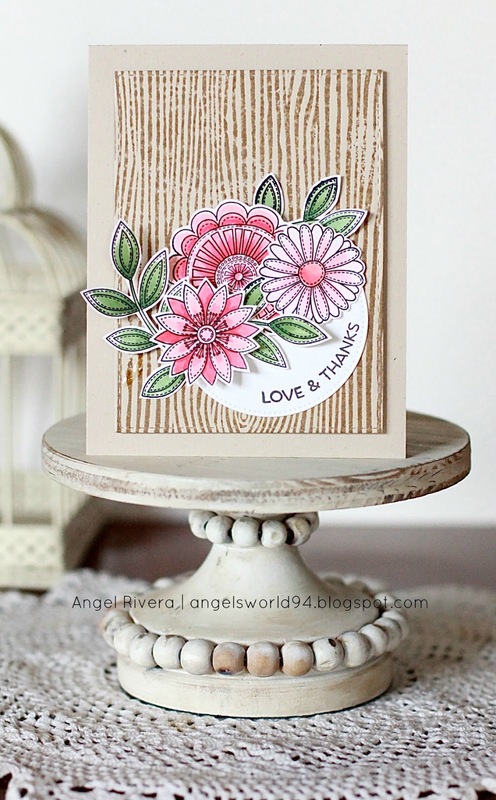 I was inspired by the pretty pink flowers and that distressed wood! I used the MFT set Funky Flowers. I colored them with Copics. I stamped an older MFT Woodgrain background stamp with kraft ink onto natural card stock. 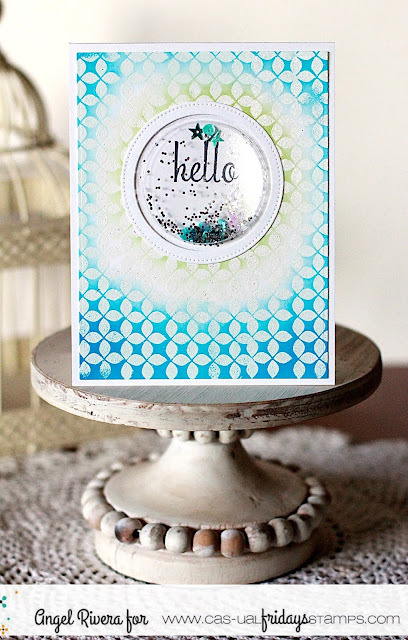 The sentiment was inked with hot fudge ink and is from the LJD Geometric Greenery set. I curved it to match the pierced circle STAX (now retired). Be sure to play along with us on the TCC Blog for your chance to win! Hi all! Here's my spin on the sketch challenge MFTWSC348. I used 3 different Ranger Oxide Inks to create a cool watercolored background then used the Celebrate Speech Bubble die to cut it out. I used the same three inks to sponge the background, then adhered the die over the top with foam adhesive. 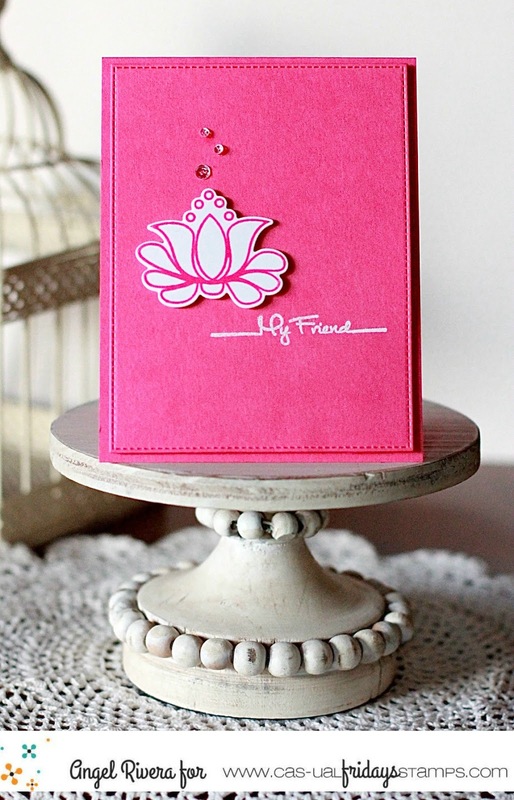 The sentiment is from an older set and is embossed with white ep and was cut out using an older Blueprints element.